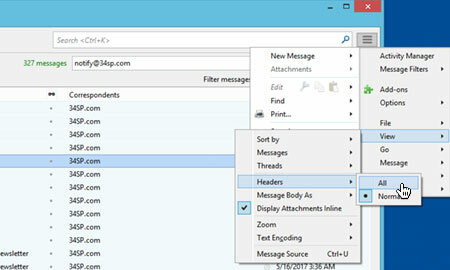 This is a quick step-by-step guide to viewing the headers of an email in Thunderbird. You may be asked to provide an email header, by a member of the 34SP.com Technical Support team. We use the information in the header to troubleshoot mail delivery problems. When an email is created, it is made up of several components. One of those components in the 'message body', which is the content of the email. Another part is called the 'header', which is normally hidden. 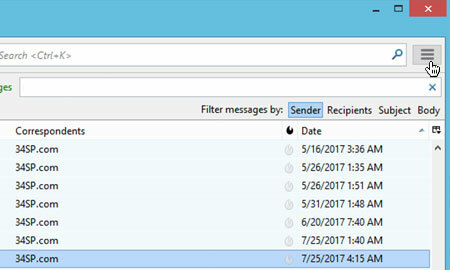 The job of an email header is to provide a detailed log of the network path taken by the email, between the mail sender and the mail receiver. 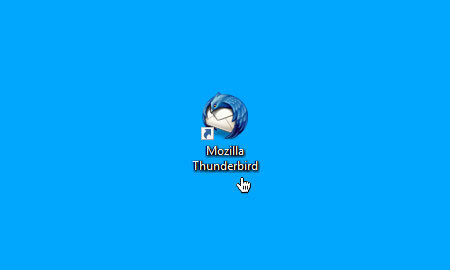 Firstly, you'll need to open Thunderbird by clicking on the Thunderbird icon. Then view the specific email you wish to view the headers of, firstly by locating it, then by clicking on it. After you have selected the email to wish to view the headers of, click on the 'Display the Thunderbird Menu' icon, located in the top right hand side of the application. From the drop down menu, choose 'View', then choose 'Headers' then 'All'. This will then update the email you have selected, so that the header information is displayed above the email's content. To may need to scroll down in order to view all the header content.